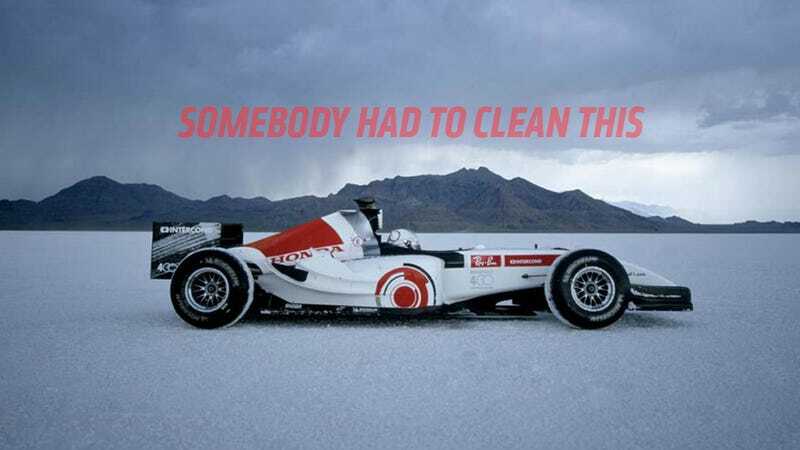 In 2006, BAR Honda went to the Bonneville Salt Flats and became the fastest outright F1 car ever made at a bit over 248 miles per hour. It was an incredible project. I just never thought about what it would take to clean up afterwards. Patrick Morgan runs the charmingly-named Dawn Treader Performance, a second career restoring modern F1 cars and Indycars, having moved on from working on them when they were new in the first place. He’s an authority on this stuff, and it’s utterly fascinating to see what he works on. In this case, it’s that salt flats F1 car. As it turns out, running on the salt flats... covers everything in salt. It’s interesting to see not just for how grody everything got, but just how wonderful F1 cars are put together. Look at how neat the hubs are. On a normal road car, these pieces are so much clunkier and globbier in their design. F1 stuff is so pure and clean and focused. Getting all that salt out took three months, apparently, making this kind of like the ultimate car cleaning, just of a priceless piece of racing history. Give Dawn Treader a follow, there are a few more photos of how this car worked and how other restorations have gone on the account. It is a satisfying and enriching experience.